Hiking in Zion National Park is spectacular, but if you are one of the many who are itching to literally explore deeper into Zion and discover the world of canyoneering there is much to learn before taking the plunge. It’s a good idea to get your feet wet in the semi-technical slot canyons in and around Zion National Park before taking the splash into the technical slot canyons and to take a full canyoneering course. Backcountry permits and limited use of the canyons will make travel plans more difficult. Permits are required for many of the semi-technical slot canyons located in Zion National Park. Caution: Always check weather and canyon conditions to make sure there is no danger of flood in the area. Remember a storm far off can result in a flash flood where you are. The park service writes the flood warnings on a board inside the Zion Canyon Visitor Center daily. Be sure to check the board before going into any slot canyon. 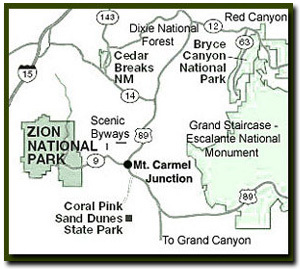 Before attempting semi-technical canyons get detailed information from the Zion Backcountry desk and current canyon conditions. 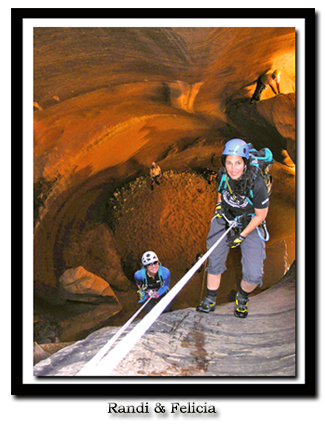 Rappelling skills are required to navigate through many slot canyons. Remember slot canyons can change dramatically in a short time. Zion Narrows - The Zion Narrows is a 16 mile hike downstream through the Left Fork of the Virgin River, with towering sandstone walls on each side. Another option is to begin at the end of Zion Canyon, and hike a few miles upstream and then back down to the end of the Riverside Walk. Orderville Canyon - Orderville Canyon is popular, fun and one of the easier technical slot canyons; in fact, most consider it to be a semi-technical slot canyon. The end of the route joins with the magnificent Zion Narrows, which is probably the world's most famous slot canyon and for good reason. For most people the Narrows is a adventure of a life-time. To get a glimpse of Orderville Canyon without doing the semi-technical sections of the trail, hike a couple of miles into the Narrows, from the Riverside Walk, and then explore Orderville Canyon. Turn around at the sign and go back to the trailhead. Zion Photo: Well know canyoneer, Kip Marshall in Zion's Telephone Canyon. Echo Canyon - This trail is found halfway up the Observation Point Trail and along the East Rim Trail. The entrance is near the point where the East Rim and Observation Point Trail meet. There is a short section of Echo Canyon that runs along the Observation Point Trail. Parunuweap Canyon - This is the most extraordinary hike anywhere! Do not attempt this if you do not have excellent map reading skills. This trek begins at the pullout just south of the Checkerboard Mesa viewpoint and traverses miles of slickrock. It drops into Fat Man's Misery slot canyon and finally into the magnificent east fork of the Virgin River. There are several ways to enter and exit this trail including ways to avoid the technical section. Plan on 10 hours to several days depending on the route chosen. The Subway - Next to the Zion Narrows, the Subway is the most well known slot canyon is Zion National Park. This canyon involves mandatory cold water swims and climbing down at least two sections where a 50 ft. rope is needed. Gear will need to be sealed in a dry bag. Slot Canyons on the East side of Zion National Park.